GlaxoSmithKline have announced that their BRAF protein kinase inhibitor Dabrafenib (Tafinlar), has been approved by both the European Commission and the United States Food and Drug Administration for the treatment of unresectable or metastatic melanoma associated with the BRAF V600E mutation. Unresectable melanoma is that which cannot be removed by surgery, while metastatic melanoma is that which has spread to other parts of the body. The new drug was developed employing BRAF enzymes generated by researchers in the Division of Signal Transduction Therapy in the College of Life Sciences at Dundee. 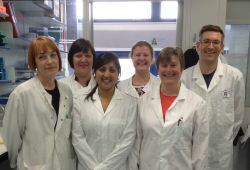 DSTT staff Samantha Raggett, Carla Baillie, Shabana Anwar-Topping, Susan Finn, James Hastie, and Hilary McLauchlan devoted huge effort to produce sufficient quantities of the BRAF enzyme for GlaxoSmithKline. The Division has been operating for the past 15 years and is a collaboration with GlaxoSmithKline and other major pharmaceutical companies, aimed at developing drugs that target protein kinases. Professor Dario Alessi, Director of the DSTT collaboration, said, ‘I am absolutely delighted that we have been able to play a significant role in aiding GlaxoSmithKline develop a new anti-cancer drug. An important remit of our research is to come up with innovative ideas, technology and reagents to help with the development of new drugs. I personally spent several years in the mid 1990s, whilst a postdoctoral researcher in Professor Philip Cohen’s lab, studying the function and regulation of RAF enzymes. ‘The technology and assays that we developed to manufacture and investigate the BRAF enzyme was transferred to our DSTT collaboration and the staff have devoted huge efforts to produce sufficient quantities of the BRAF enzyme for GlaxoSmithKline. It is extremely gratifying to learn that the fruits of this labour have played a role in the discovery of a new drug that can benefit patients. The DSTT was founded in 1998, expanded in 2003 and renewed for a second time in 2008. At its third renewal in 2012, the DSTT had attracted £50 million in funding since it started. It is widely regarded as a model for how academia and industry can interact productively and was awarded a Queen’s Anniversary Prize for Higher Education in 2006. The DSTT works to accelerate the development of new drug treatments for major global diseases including cancer, arthritis, lupus, hypertension and Parkinson’s disease in a market that is estimated to be worth £15 billion per annum and projected to reach £30 billion per annum by 2025. With more than 1000 scientists, research students and support staff from 58 countries and external funding in excess of £30 million per year, the College of Life Sciences at the University of Dundee is one of the largest and most productive Life Sciences research institutes in Europe. Consistently voted one of ‘the best places for a life scientist to work’ by The Scientist magazine, the College has an international reputation for its basic and translational research and was recognised in the 2011 Biotechnology and Biological Sciences Research Council Excellence with Impact Awards for ‘Greatest Delivery of Impact’. The University of Dundee is the central hub for a multi-million pound biotechnology sector in the east of Scotland, which now accounts for 16% of the local economy.